The Raritan Valley Community College (RVCC) Spring 2014 semester included a redesigned Environmental Field Studies Course taught by Dr. Jay Kelly, Assistant Professor of Biology and Environmental Science in the Department of Science and Engineering, with guest speakers Nellie Tsipoura, Senior Research Scientist, and Kelly Wenzel, Project Coordinator, at the New Jersey Audubon. Previous versions of the course focused on student-driven independent research projects and/or more structured modules, exposing students to the process of conducting scientific research through a variety of less directly related community-based field research and conservation or restoration projects. For example, community well water testing, superfund sites, amphibian road crossing surveys, and invasive and endangered species surveys. Dr. Jay Kelly with RVCC students. The new version developed through SENCER-ISE funding helped focus and deepen the course content, providing a useful conceptual framework to integrate different course materials and an opportunity for students to participate in meaningful community-based research and outreach being conducted by NJ Audubon. In all, this exposed the students not only to the principles and practices of basic scientific research, but also to the relevance of research methods and results to solving real-world problems, and moral and civic values, roles, and responsibilities of science and scientists in matters of civic importance. Students were introduced to basic ecological concepts related to forest structure and composition and how these can be applied to understanding and assessing forest health. Students conducted extensive field and library research on factors such as forest history, land use, invasive species, deer overabundance, endangered species, climate change, landscape context, public policy, and forest management. After personally delving into the causes and consequences of these factors, students engaged in the development of solutions to these problems, focusing on integrating invasive plant species into the citizen science training being conducted by NJ Audubon, as well as assessing the effectiveness of existing restoration efforts and forest management plans being applied to local forest preserves. At the end of the semester, students and NJ Audubon staff conducted workshops for citizen science volunteers at the NJ Audubon. In preparation for these workshops, Kelly Wenzel met with the students and helped them understand how to create lesson plans for volunteers and brainstormed with them on a design for the field manual, which will be used to identify invasive plants. Dr. Tsipoura also spoke to the class to explain the purposes of the citizen science project, what the students are expected to produce, and how to make the presentations tie in and flow with the rest of the workshop. The students also did a presentation in the class before the citizen presentation, in which they commented on each other’s presentations to strengthen their content. 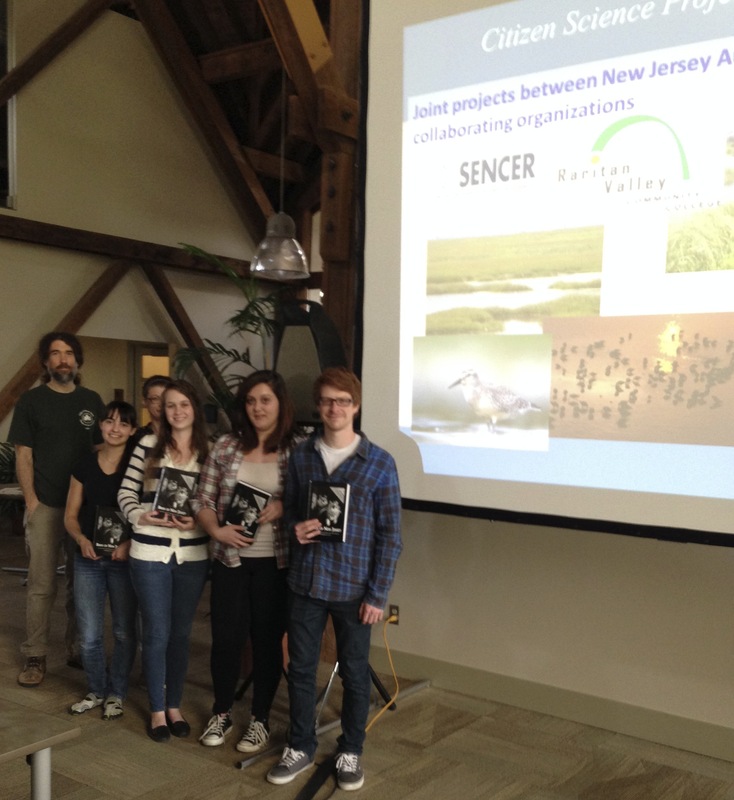 During the workshops, citizen science volunteers were presented with background information on the citizen science at NJ Audubon and the collaboration between RVCC and NJ Audubon through the SENCER-ISE grant. Then they were introduced to the purposes of the project and the scientific and civic questions relating to forest health in New Jersey. 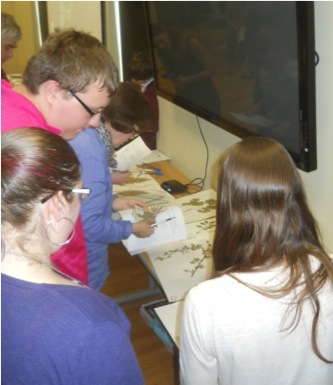 This session was followed by training in bird and invasive plant identification. This is done in a classroom setting, where the citizen scientists were presented in learned in great detail about species identification with the aid of photos in a PowerPoint presentation, and in the case of birds an audio component with bird songs. The bird identification component was presented by NJ Audubon staff, while the invasive plant identification was presented by the RVCC students. Finally, the last hour of the workshop was spent going through the protocols for data collection for birds and invasive plants. Since the Audubon uses rigorous scientific methodologies to collect data that can be used for conservation and management purposes, the speakers impressed upon the volunteers the importance of careful data collection and went into detail on what this involves. Citizen scientists participate in a field research workshop at the NJ Audubon. Photo by Jay Kelly. Each citizen scientist received a packet with CDs of all the presentations and of bird songs, the protocols, any additional paper work, and the field manual that was developed by the RCVV students. These materials are also available online. Each of these citizen science volunteers was assigned five to ten locations within a selected forest site and will conduct birds and/or invasive plant surveys and collect information on deer presence between late May and early July. Overall there are 375 locations throughout natural areas within the Raritan and Piedmont regions. Once the citizen scientists complete their surveys, they will enter their data online and submit them to NJ Audubon. In addition to reflections students- excerpts of which are included on this page, Dr. Kelly also conducted a quantitative pre- and post-assessment of student interest, concern, knowledge and engagement on issues related to forest health. The results found students to exhibit significant increase in each of these domains, averaging a 26% increase on scores (ranked from 1-5) on 16 questions overall. Posted in Partnerships, Raritan Valley Community College & New Jersey Audubon Society.